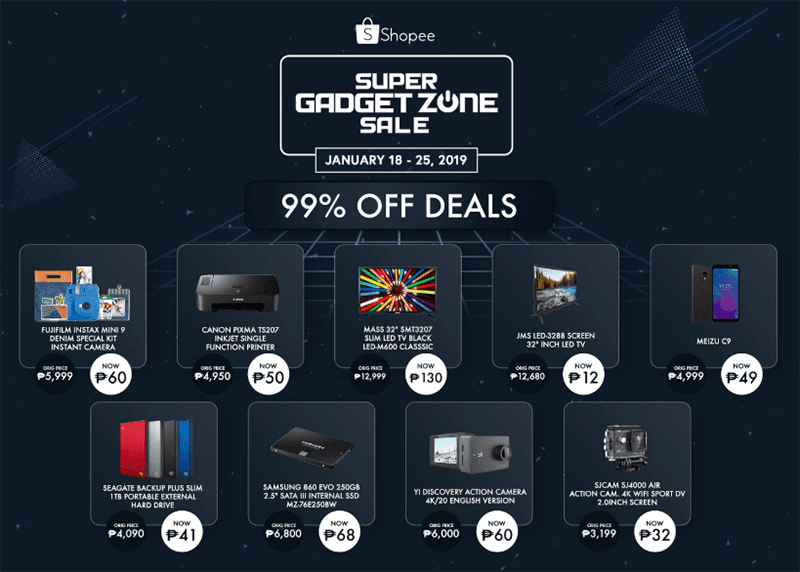 Shopee Super Gadget Zone Sale is back with up to 99 percent off! Home / news / services / shopee / Shopee Super Gadget Zone Sale is back with up to 99 percent off! 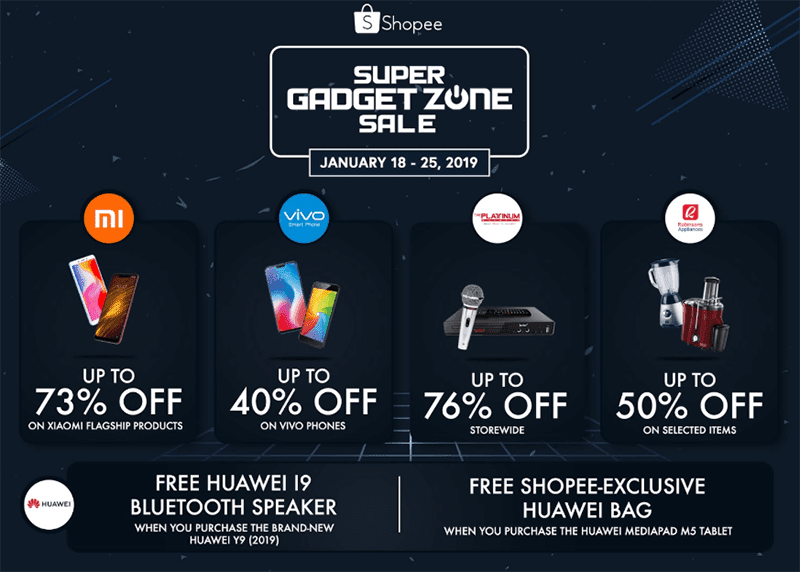 Shopee announced that they are bringing the Super Gadget Zone Sale back! During the sale, you can get up to 99 percent off on popular gadgets like phones, HD TVs, Action Cameras, and more from January 18 to 25, 2019. The brands included in the sale are Xiaomi, Platinum Karaoke, Vivo, ASUS, and Robinson's Appliances. There's FREE shipping with a minimum spend of PHP 350 from the above-mentioned brands. The Shopee Super Gadget Zone Sale will also feature 3 rounds of flash sales every day. Martin Yu, Associate Director, Shopee Philippines, said, We are excited to bring back the Super Gadget Zone Sale to deliver more cost-savings to Filipinos shopping for the latest gadgets in the new year. Electronics have always been one the most popular categories among Filipinos and last year’s Super Gadget Zone sale was extremely well received. This year, we are partnering even more top brands including Vivo, Xiaomi, ASUS, Platinum Karaoke, and Robinsons Appliances, to deliver another round of Lowest Price Guaranteed deals on their best-selling items. Topped off with free shipping and daily flash sales, we look forward to kicking off the new year with enticing deals and exclusive promotions for our users. For Xiaomi, there will be up to 73 percent off on their flagship products including the POCOPHONE F1 and Redmi 6A. For Vivo, there's up to 40 percent off on the likes of Vivo V9 and Vivo Y69. For Platimum Karaoke, there's up to 76 percent off storewide like KS-5 Jr. Lite and Platinum Sound Bar. For Huawei, there's a free Huawei i9 Bluetooth Speaker for every purchase of Huawei Y9 2019 and Shopee-exclusive Huawei bag with every purchase of MediaPad M5 tablet. For Robinson's Appliances, they have up to 50 percent off on items like Delichef Blender and Russel Hobbs Juicer. For Anker, the first 30 shoppers who will spend at least PHP 2,000 on their official store will get an exclusive Powercore Travel Pouch. To know more about the promo, check this link: https://shopee.ph/m/super-gadget-zone-sale.